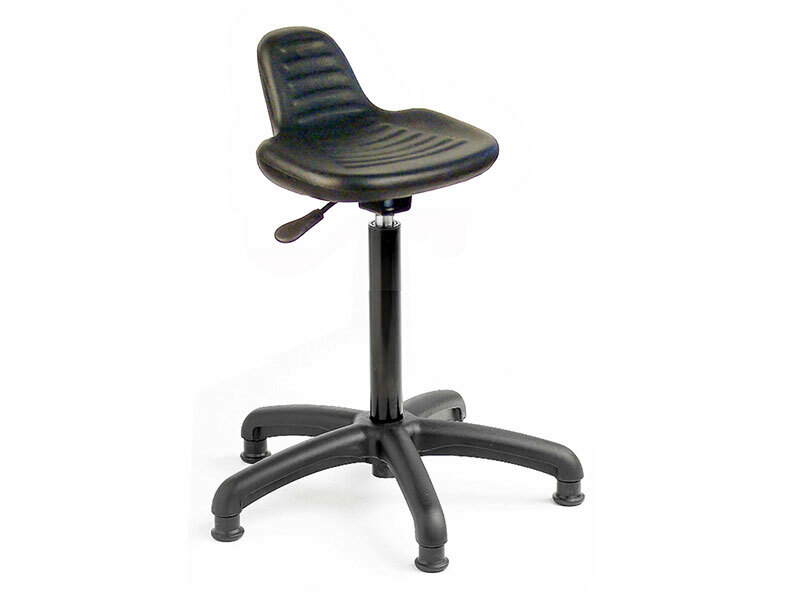 The gas lift posture stool is a workhorse for industrial, mechanical and commercial seating. The glide base makes this stool structurally stable – allowing lateral movement across the floor but not as readily as would occur with the castors model. The seat is constructed of long-wearing polyurethane. This material can be easily wiped with a damp cloth or even washed with warm soapy water to remove grease, dirt and other stains. Until washing time, the black colour of the seat cover actually conceals accumulating dirt, allowing the seat to maintain a professional appearance. The gas chamber in the central support post not only allows easy and fast height adjustment, it provides a shock absorbing bounce to make long work shifts easier to handle. 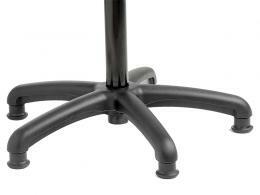 The height of the stool is meant to be natural, making a footrest unnecessary. 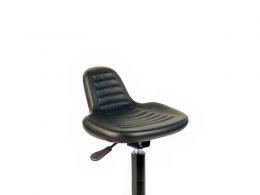 The curve at the back of the seat provides additional back support, reducing back pain. The broad stance of the base provides further structural stability – useful in busy workplaces with lots of people moving around the space. This backless stool can be easily stored under counters and table and has a smaller “use profile,” making it the perfect choice for tight work environments like behind counters. 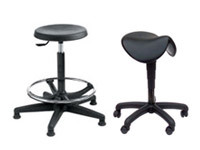 The gas lift posture stool is suited for use in research laboratories, medical and dental offices, auto mechanic shops, behind-counter staff in retail and other public-facing commercial establishments, construction and real estate development offices, on-site planning offices and others.